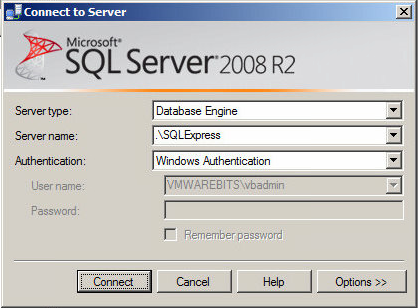 The purpose of this article is to explain how to use Microsoft SQL Express to create a database server for the VMware Horizon View Event Database and the Composer database. In a production environment you should use one of the supported databases (MS-SQL or Oracle). But when setting up a proof of concept or a test environment (for example for educational purposes) a SQL Express database will also suffice. The source for this article is the on-line documentation for VMware Horizon View. Here are the two locations for the original documents. They describe however how to setup the database with the supported databases while I describe how to use SQL Express. My installation for Horizon View 5.2 is based on Windows Server 2008 R2 servers (64 bit, as required). You can choose to install one SQL Express instance and create the necessary databases on that server. Or you can also install a SQL Express instance on your Connection Server for the Event Database and one on the Composer Server for that service's database. 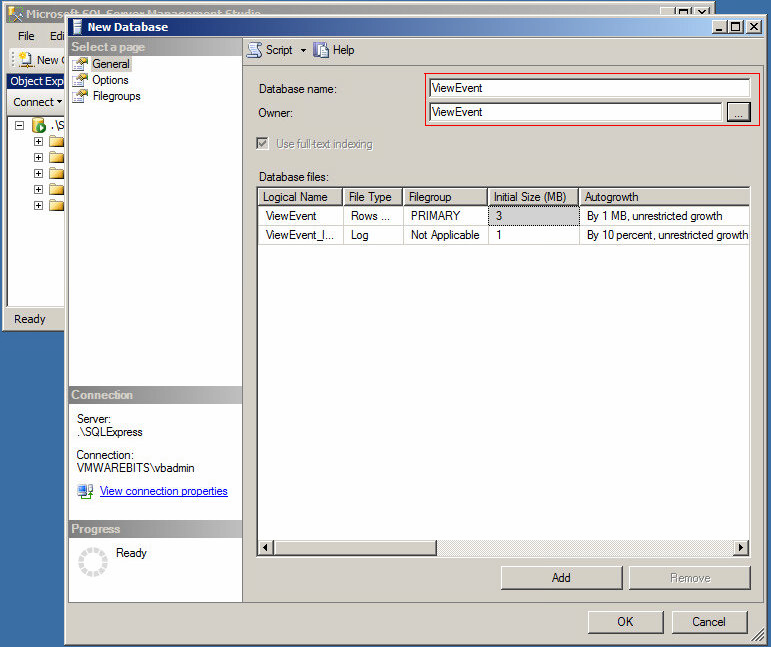 If you plan to have multiple databases, maybe you also want to use it for vCenter Server. In that case using a single database server is a good idea to keep your setup simple and efficient. During installation I have selected all defaults except for what is explained below. You can for example choose to not install all components. As long as you have the Database Engine Services and the Management Tools you can configure what you need for the purpose of creating an event database. In one of the first steps you define the Instance-name of the SQL-Express server. The default is SQLExpress, which works or might be changed to something custom. The step during installation where you must make a change from the defaults is with the Authentication Mode. Make sure to select Mixed Mode. This allows you to create database users in the SQL server. After login select Security, right click and choose New -> Login. In this example I have created a user name ViewEvent, import to select SQL Server authentication and configure the password policy according to your organizations rules or disable it if not necessary. In the image below the user is created for the Event Database, create a similar user for the Composer Database. Next it's time to create a new database. In SQL Management Studio click Databases –> New Database. Provide a name for the database and select the user that will become the owner of the database. 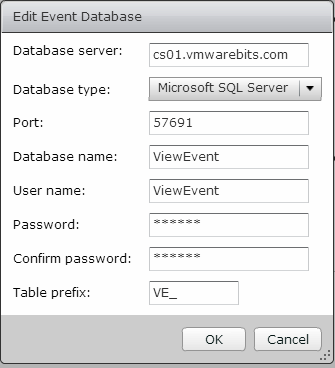 For the View Event database this is the login ViewEvent that was created in the previous step. Perform a similar task for the Composer Database. When you are configuring this setup for the Event Database you must also know the port to connect to.To find this information you must start SQL Server Configuration Manager that is also installed on your server when installing SQL Express. Under SQL Server Network Configuration select Protocols for SQLEXPRESS. I the right panel right-click TCP/IP and select Properties. 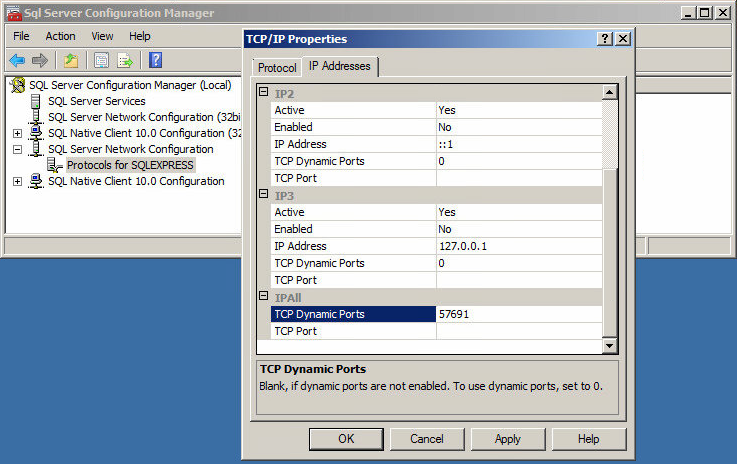 Next open the IP Addresses-tab and scroll down to the TCP Dynamic Ports. In this example it is 57691 which will be used later on to connect to the database. If SQL Express for the Event Database runs on the same server as your connection server no firewall ports need to be opened. Otherwise with the information you just found open the correct port. Next it's time to connect to the Event Database and if needed also to the Composer Database. 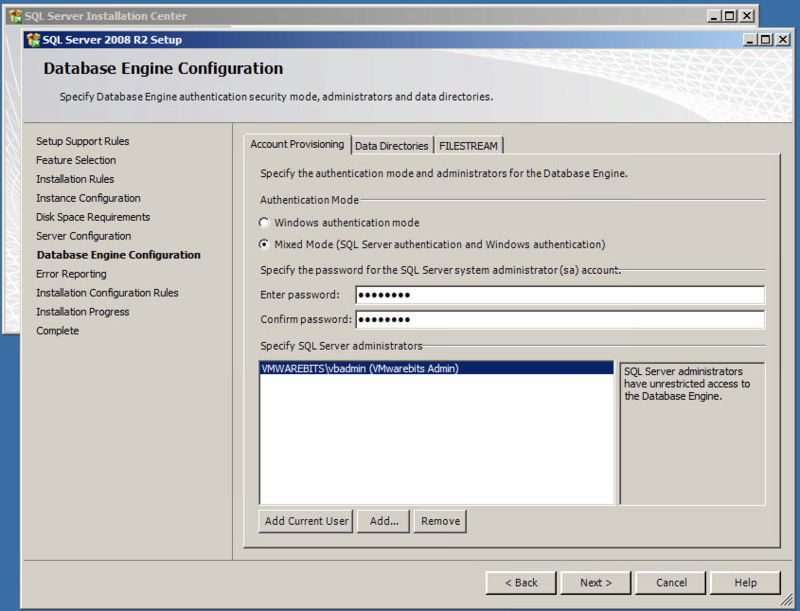 Login to the Horizon View Administration portal and under View Configuration - Event Configuration configure the Event Database settings, such as in the image below, using the server and user configuration you have just created. 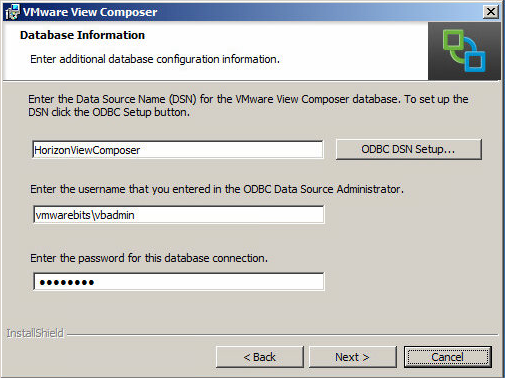 Before installing Composer the database has to be setup including an ODBC connection to the database. 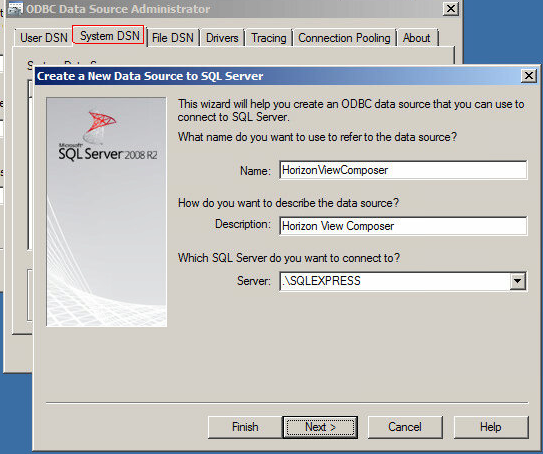 In the ODBC configuration utility click the System DSN tab, click create and choose the SQL Native Client. Next provide a name for the connection that you will use during installation. And provide the server details to connect to. 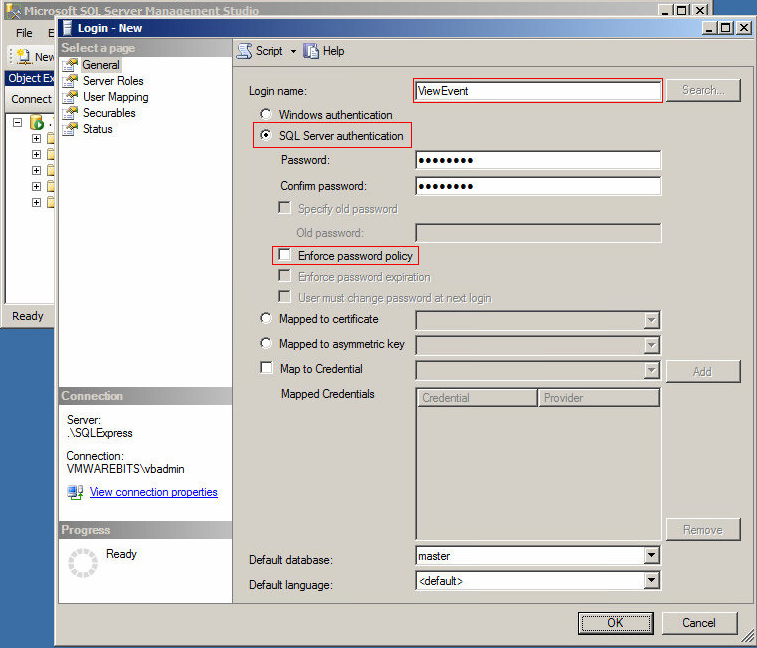 For the authentication options change the configuration to SQL Server authentication and provide the Login ID and password of the user for the Composer Database that you have created previously. 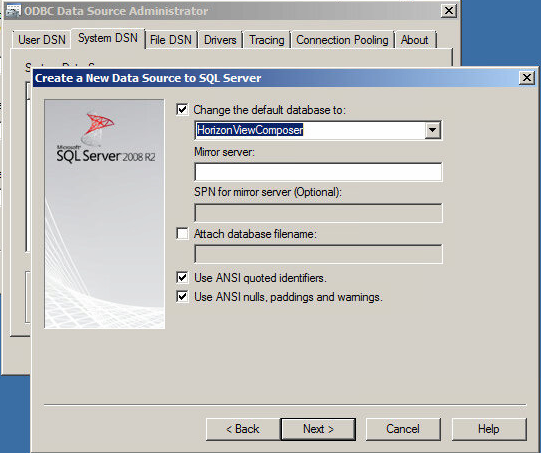 For the System DSN change the default database to the newly created database for Composer. For the rest accept all the defaults. At the end of the configuration you can test the connection to the Composer Database. If it works it's time to install Horizon View Composer. During the install point to the newly created System DSN. 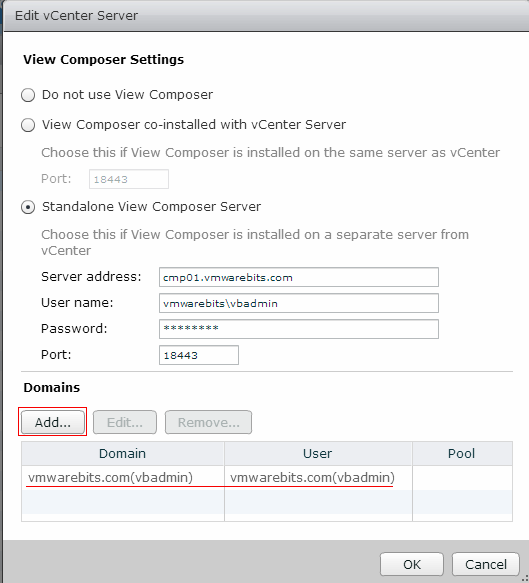 Once the Composer server is installed you need to connect the View-installation with vCenter to that server. 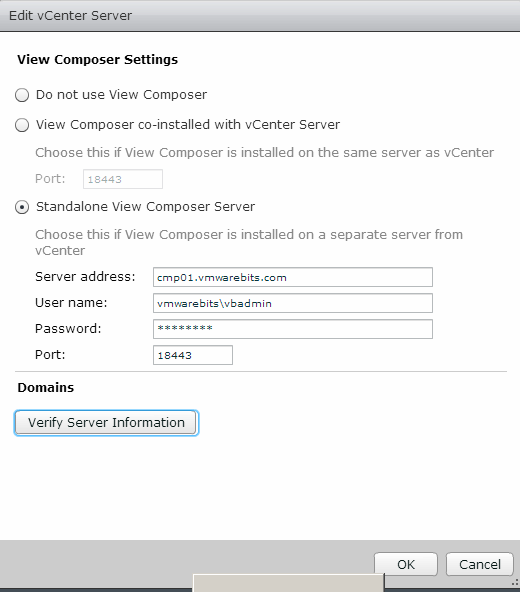 Login to the Horizon View Administration portal and under Servers select the vCenter server that you want to connect to the Composer Server. Click Edit and configure the Composer Settings. In this example it is a stand-alone Composer Server. After configuring the settings click the button Verify Server Information. This should successfully connect to the Composer Server. Once that is done don't forget to connect the Active Directory domain where you plan to create the linked clones.